Lotus root (yeongeun) is the underwater stem of the lotus plant, which is rich in fiber and essential nutrients such as vitamin C and potassium. My favorite way to eat this crunchy and starchy root is to simply stir-fry (bokkeum) it with some other vegetables. To prepare the lotus root for cooking, peel the skin, slice or cut into bite size pieces, rinse, and then soak in the vinegar water. This will remove any impurities inside and the slight bitterness of the lotus root and prevent discoloration. You can also prepare lotus root by pre-boiling in vinegar water for a couple of minutes if you like it softer. Colorful bell peppers pair really well with the mild tasting lotus roots, adding a slightly peppery flavor to the dish. 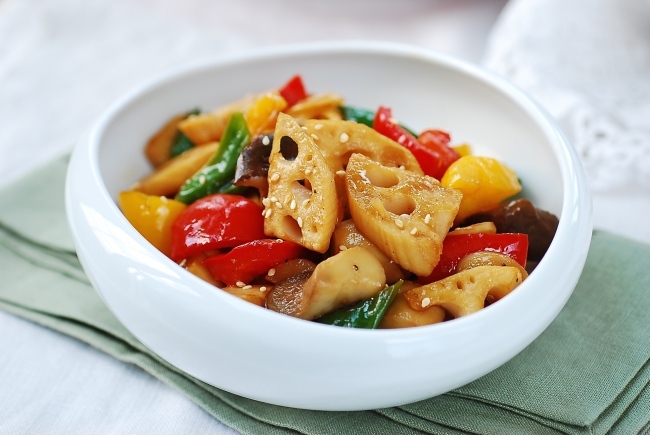 This stir-fry dish comes together very quickly once you have prepared the vegetables. Enjoy it as a side dish or a light meal with a bowl of rice! Peel the skin of the lotus root with a potato peeler. Cut the lotus root in half lengthwise and then into bite size pieces. Rinse in water. Add 2 tablespoons vinegar in 3 cups of water, and soak the lotus root for 20 to 30 minutes. Cut the peppers and mushrooms into small bite size pieces. Heat a large skillet with two tablespoons oil. Add the garlic and lotus root, and lightly sprinkle with salt. Stir fry until the lotus root pieces turn translucent, 3 to 5 minutes, stirring occasionally. Add the mushrooms, and stir fry until the mushrooms turn soft. Add the peppers, and stir fry until the peppers are slightly wilted. Stir in the soy sauce, oyster sauce, rice wine, and corn syrup. Continue to cook, stirring well, until the sauce is almost gone. Drizzle the sesame oil at the end, and sprinkle with the sesame seeds to serve.